Master the SAT II German Subject Test and score higher... Our test experts show you the right way to prepare for this important college exam. 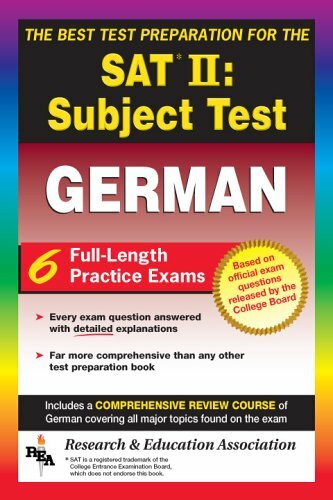 REA's SAT II German Subject test prep covers all German language areas to appear on the actual exam including in-depth coverage of declensions, verb tenses, passive voice, word order, and more. The book features 6 full-length practice SAT II German exams. Each practice exam question is fully explained to help you better understand the subject material. Use the book's glossary for speedy look-ups and smarter searches. Follow up your study with REA's proven test-taking strategies, powerhouse drills and study schedule that get you ready for test day. - 6 full-length practice SAT II German Subject exams. Each exam question is answered in complete detail with easy-to-follow, easy-to-grasp explanations. Research & Education Association (REA) is an organization of educators, scientists, and engineers specializing in various academic fields. Founded in 1959 with the purpose of disseminating the most recently developed scientific information to groups in industry, government, high schools, and universities, REA has since become a successful and highly respected publisher of study aids, test preps, handbooks, and reference works. REA's Test Preparation series includes study guides for all academic levels in almost all disciplines. Research & Education Association publishes test preps for students who have not yet completed high school, as well as high school students preparing to enter college. Students from countries around the world seeking to attend college in the United States will find the assistance they need in REA's publications. For college students seeking advanced degrees, REA publishes test preps for many major graduate school admission examinations in a wide variety of disciplines, including engineering, law, and medicine. Students at every level, in every field, with every ambition can find what they are looking for among REA's publications. While most test preparation books present practice tests that bear little resemblance to the actual exams, REA's series presents tests that accurately depict the official exams in both degree of difficulty and types of questions. REA's practice tests are always based upon the most recently administered exams, and include every type of question that can be expected on the actual exams. REA's publications and educational materials are highly regarded and continually receive an unprecedented amount of praise from professionals, instructors, librarians, parents, and students. Our authors are as diverse as the fields represented in the books we publish. They are well-known in their respective disciplines and serve on the faculties of prestigious high schools, colleges, and universities throughout the United States and Canada. Who takes the test and what is it used for? (2) To demonstrate proficiency in German. The SAT II: German exam is designed for students who have taken two to four years of German. The SAT II: German Subject Test is developed by the College Board and administered by Educational Testing Service (ETS). The test development process involves the assistance of educators throughout the country, and is designed and implemented to ensure that the content and difficulty level of the test are appropriate. The SAT II: German Subject Test is offered once a year, in June, at many locations throughout the country. You must pay a registration fee to take the SAT II: German Subject Test. Consult the publication Taking the SAT II: Subject Tests for information on the fee structure. Financial assistance may be granted in certain situations. To find out if you qualify and to register for assistance, contact your academic advisor. Remember that the SAT II: German Subject Test is designed to test knowledge that you have acquired throughout your education. Therefore, the best way to prepare for the exam is to refresh yourself by thoroughly studying our review material and taking the sample tests provided in this book. Our practice tests will familiarize you with the types of questions, directions, and format of the SAT II: German Subject Test. View More In College & High School. If you have any questions about this product by Brand: Research Education Association, contact us by completing and submitting the form below. If you are looking for a specif part number, please include it with your message.